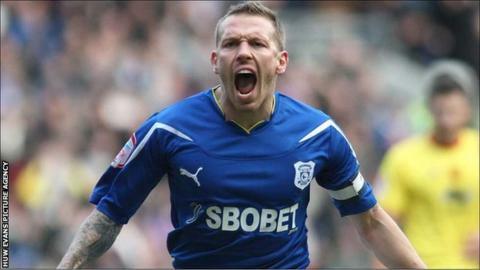 Cardiff City have confirmed they "would love to talk" to Craig Bellamy if the Wales striker opts to leave Liverpool. The Bluebirds are checking their finances in case they have a chance to re-sign the 32-year-old who captained Cardiff during a season-long loan spell in 2010-11. Bellamy has one year left on a two-year deal at Liverpool after joining from Manchester City in August 2011. "We'd love to have Craig back," said Cardiff chief executive Alan Whiteley. "But he is a Liverpool player and until Liverpool and Craig decide what they are going to do, there are conversations that we can't even have at the moment. "We don't know how it is going to pan out and it is for Craig and Liverpool to decide what they are going to do first. "But if Craig decides he is going to leave Liverpool and Liverpool are prepared to let him go, then clearly we'd love to talk to him." Bellamy, whose family home is on the outskirts of Cardiff, scored 11 goals in 35 games during his loan spell at the Cardiff City Stadium. The Cardiff-born forward, who has scored 19 goals in 69 Welsh internationals, is a former Norwich City team-mate of Cardiff boss Malky Mackay. Cardiff's owners recently announced a controversial £100m investment plan as the club that have suffered three successive play-off disappointments bid for Premier League promotion. A condition of the financial injection from owner Tan Sri Vincent Tan and chairman Dato Chan Tien Ghee, which includes funds for player recruitment, is the controversial move of changing Cardiff's shirt colour from blue to red in the hope it could expand the club's appeal in "international markets." Sections of the Cardiff faithful are upset at the shirt colour change but a signing of Bellamy's profile and stature would help quell any fan discontent. Mackay made a last-ditch bid to sign Bellamy permanently for Cardiff in August 2011 before the player joined Liverpool. Mackay is also is close friends with new Liverpool manager Brendan Rodgers and Bellamy is a fan of Rodgers' style of football - but has often spoken of his desire to inspire boyhood club Cardiff into the Premier League. "He's a Cardiff boy," added Whiteley. "So it would be great if he could come here." The Bluebirds have already signed England under-21 international midfielder Jordon Mutch and former England under-21 goalkeeper Joe Lewis this summer.